Introducing the 6mm NeoMagnetic Cube! When we say 6mm, it might not sound a-lot bigger than our regular 5mm NeoMagnetic Cube but multiply this additional millimeter by 216 individual spheres and you get one big cube! Look at the pictures to see how the 6mm NeoMagnetic Cube compares to the regular 5mm Cube. At 180 grams, the 6mm NeoMagnetic Cube is almost twice as heavy as the 5mm one! 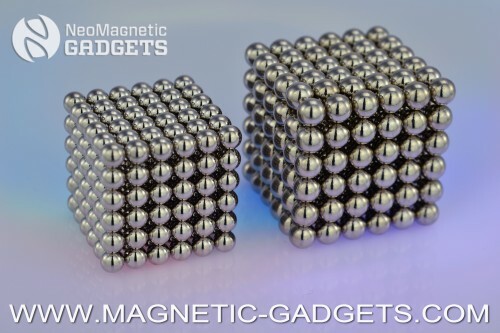 Made of 216 high strength, high quality Neodymium magnetic spheres this NeoMagnetic Cube will keep you entertained for hours. These are the some of highest quality neodymium cubes on the market, their quality surpasses even the more expensive brand name cubes. Trust us, we tried most of them! The coating on low grade cubes will chip quickly, exposing the neodymium core which will soil your hands. Our cubes were custom made to meet the highest quality standards. The coating on these cubes will last for a very long time. It won’t leave you with dirty hands and the feeling that you’ve wasted money on a low grade item.